Paper Stream is for all your paper products, such as office paper, evenlopes, boxboard, newprint, and small amounts of old corrugated cardboard. Container Stream is for all the other basic recyclable materials that are no paper-based. Materials include beverage containers, tetra packs, plastics #1-#7, and tin. Old corrugated cardboard is for large producers of the material. All boxes must be emptied of styrofoam and other packing then broken down and flattened for collection. Organics is for all your food waste and paper towels. All material collected must be cleaned and free of any food residue. Failure to do so will result in collection being refused. 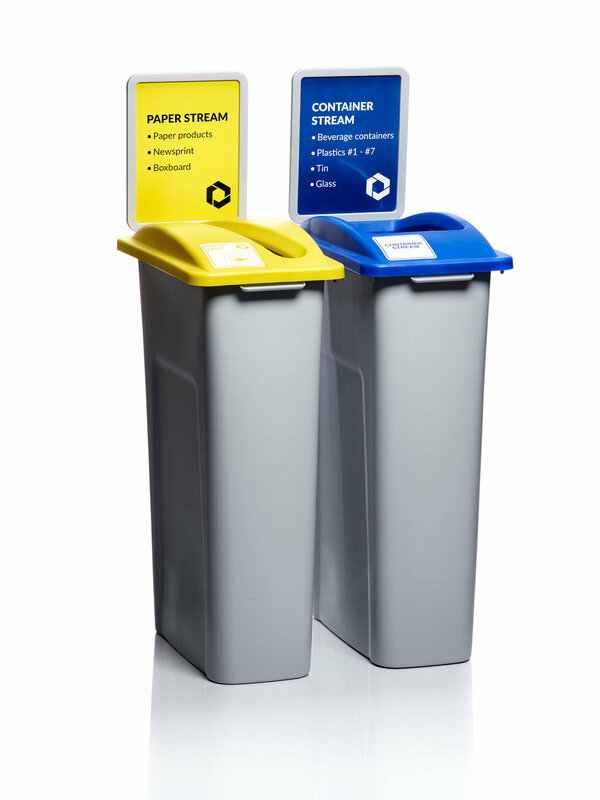 For Paper and Container Stream, WBBR supplies a pair of bins (see right). These Busch System Waste Watcher Series bins at 23-gallons and 30'‘ high. The signage can also be customized to suit your office’s needs. Bins and dumpsters for old corrugated cardboard and organics are subject to availability. To learn more or request a quote, please fill out the form below. Please select any material you are interested in having collected.